Following severe thunderstorms and heavy rains on Sunday night, mudslides cascaded off a Yellowstone National Park mountainside onto a road, blocking off the eastern entrance to the park. No one was injured, but 16 people had to be rescued from their cars that were trapped in the mud, according to the National Park Service. As of Tuesday, two of the four cars were still lodged in the mud. 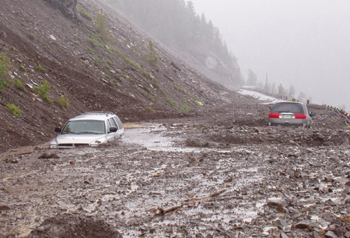 Heavy rains loosened rock and mud from a mountainside near the east entrance to Yellowstone National Park over the weekend, causing mudslides that stranded 16 people. Photos courtesy of the National Park Service. Yellowstone spokesman Al Nash said an estimated 10,000 cubic feet of debris covered the roadway. The mudslides reached up to 10 feet deep and 90 yards long and took out guardrails and parts of the road. 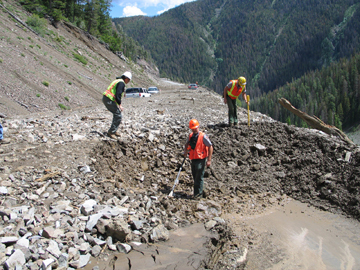 Contractors and Yellowstone park staff began removing debris from the roadway on Tuesday. Until the debris is removed from the roadway, Yellowstone officials say they cannot estimate when the east entrance will reopen or how much the repairs will cost. Other entrances to the park remain open. Cleanup work began on Tuesday, but Yellowstone officials cannot yet estimate when the road will reopen. The National Weather Service recorded 1.4 inches of rain over 24 hours in the area, which had been stripped of vegetation by forest fires that charred more than 23,500 acres last summer.